EOS Poly Top Seal CSx-2O (ST-2O) is a unique waterborne, non-flammable polysiloxane/Teflon penetrating sealer. It is specifically engineered for the treatment of concrete that will have contamination spills, commercial kitchen floors, plant or shop maintenance areas, veterinary clinics, kennels, dog runs or where there will be possible animal contamination. Poly Top Seal CSx-2O will bead contaminants on the surface for easy clean up. Poly Top Seal CSx-2O will protect against moisture intrusion as well as oils, greases and a variety of mild solvents. Poly Top Seal CSx-2O is a highly cost effective option to urethane or epoxy deck coatings. It is a penetrating system that is not susceptible to U.V. degradation. The Poly Top Seal CSx-2O (ST-2O) system utilizes unique chemistry's of polysiloxanes coupled with proprietary technologies to provide high performance products that are environmentally safe. Poly Top Seal CSx-2O is a highly reactive, cross-linked Polysiloxane / Teflon formulation that is capable of penetration rates ¼ - ¾ inch into the concrete relative to the surface finish of the concrete, a broom finished surface will have penetration of up to 1 ½ inches. The formula attaches itself to the substrate particles by electrochemical means. During the curing process the system reacts with certain elements in the concrete to form a subsurface vapor permeable elastameric membrane. The membrane allows the treated matter to breathe normally while impeding contaminants from spreading, wetting or absorption through capillary channeling. 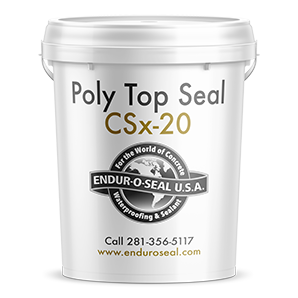 Poly Top Seal CSx-2O may increase the slip coefficient when applied on smooth steel trowel finished surfaces. Not recommended for extra smooth surfaces. Poly Top Seal CSx-2O is VOC compliant.